Table service at McDonald's? Yes, it's becoming a thing. The fast food giant has begun offering table service in some restaurants in the U.S. in a bid to revamp its image and reverse falling sales. Customers can come into the restaurant, order food at a touchscreen kiosk, then go to a table to wait for their meal to be brought over. 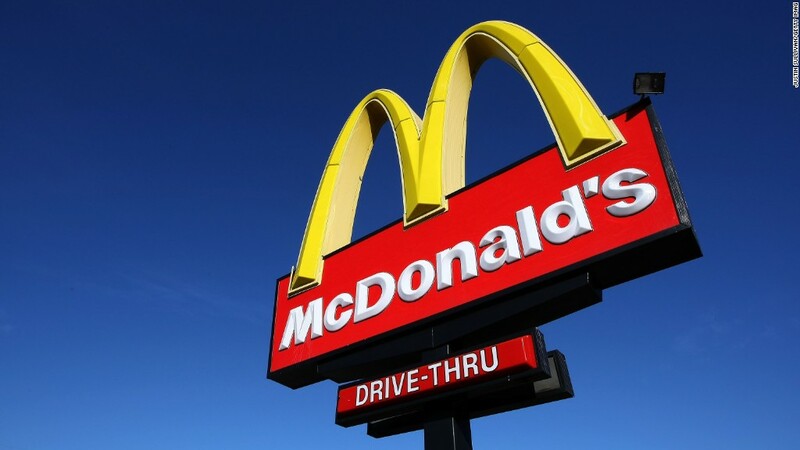 A McDonald's (MCD) spokesperson said the service has been popular in Australia, Germany and France, and now the company is testing it out at 50 locations in the U.S. and one restaurant in northern England. 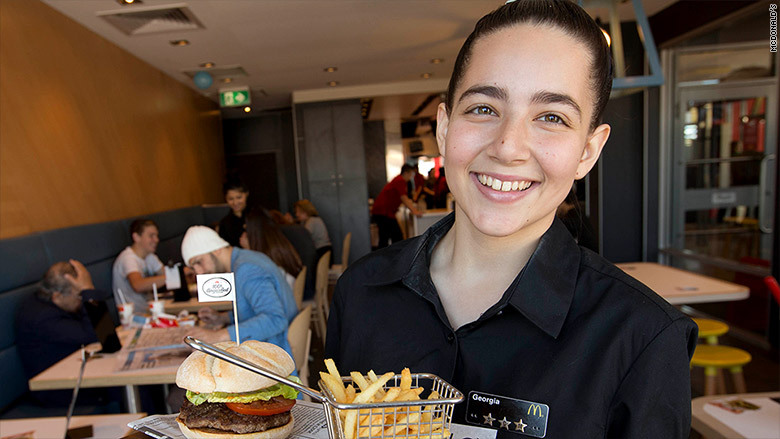 McDonald's waitresses are not an uncommon sight in Australia. In a statement, the company said it is "significantly investing in ... restaurants to create an exciting new environment and improve the customer experience." In the U.S. restaurants that are testing out this service, customers can personalize their order by adding different kinds of cheese, buns and toppings including guacamole, jalapenos and grilled mushrooms. McDonald's is struggling to transform itself as it experiences a marked decline in sales and profits. Competitors including Shake Shack (SHAK) and Chipotle (CMG) are eating McDonald's lunch. Steve Easterbook, who took over as McDonald's CEO in January, has promised to improve the chain's food. Back in May he said he wanted to experiment with new sandwiches and changes to how customers order. So far the company has revamped its Hamburglar mascot and is reportedly set to begin offering all-day breakfasts in the U.S. this autumn. 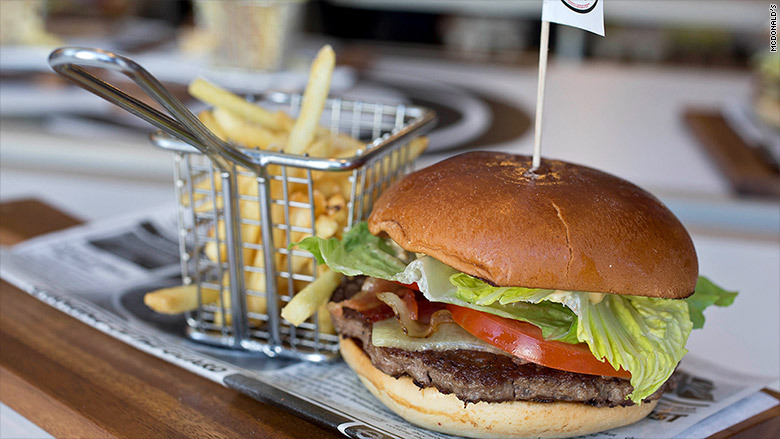 It also recently began offering a new strange-looking burger in Australia with lettuce 'buns'. There's even word on the street that McDonald's is considering including kale in menu items next year. 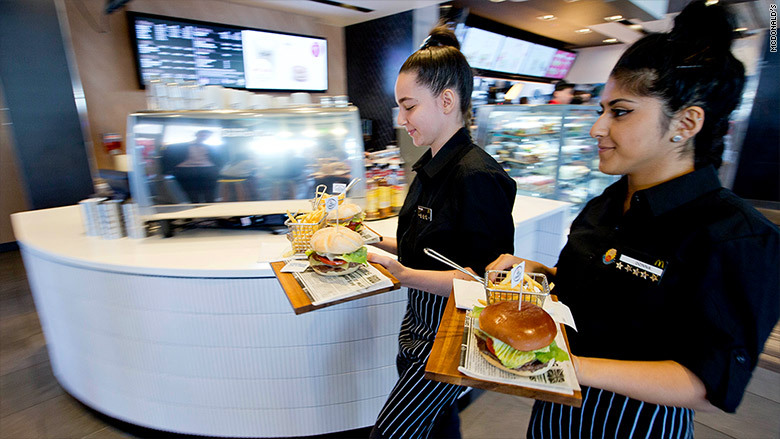 McDonald's offers table service in restaurants in Australia, France and Germany. It's also testing the service in the U.S. and U.K. This Aussie McDonald's meal has an upscale feel.